Are Public Honors Programs Shifting too Much Toward ‘Experiential Learning’? The following post is by site editor John Willingham. For more than six years I have been fortunate enough to receive large amounts of data from public university honors colleges and programs. The data I received for the 2018-2019 edition of INSIDE HONORS pointed toward a trend in honors education: the partial substitution of experiential learning for traditional academic coursework. First, what is experiential learning? Students can earn credit (or “points” or “units”) for the following: doing internships, studying abroad, or conducting mentored research; publishing in journals and making presentations at conferences; applying for national awards (Truman Scholarships, Goldwater Scholarships, etc. ); serving on honors committees and in other student groups, and engaging in leadership training; obtaining certification or experience in promoting diversity, social innovation, and group problem solving; and for participating in the many types of “service learning,” usually involving participation in community or university volunteer activities. Internships, mentored research, and study abroad have long been components of many honors programs; they often carry course credit. (Some of the activities listed above do not award course credit but only points for honors completion.) Since the Great Recession, internships are increasingly important for practical reasons. The same can be said for some training or experience in collective problem solving. Sometimes the latter can take the form of group projects that have a vocational focus (entrepreneurship, engineering); other group projects take a turn toward solving social problems. So it is clear, at least to me, that part of the focus on experiential learning is a response to changing economic conditions. And the experiential options all appear to have laudable purposes. I believe advocates of experiential learning when they say their programs are “high impact” and can teach lifetime lessons to students. The question is not whether experiential learning is worthwhile but, rather, how much of it is appropriate? Thus far, the trend toward experiential learning appears to be centered almost exclusively in public university honors programs. I reviewed honors requirements for 40 public university honors programs, many of them in flagship institutions, along with the same number of honors programs in private universities of approximately equivalent reputation. Of the public honors programs, eight have implemented or increased the impact of experiential learning toward honors completion in the last two years. But only one private university honors program has done so. Note: Below please see the public and private universities I reviewed for experiential learning emphasis. Those in bold have notably increased experiential learning in their honors programs during the past two years. This does mean that, in each instance, experiential learning is necessarily over-emphasized. Some of the programs have retained at least one honors completion option that requires extensive academic coursework. As recently as two years ago, I observed only two or three public honors programs that featured the emphasis on experiential learning that I see today. If the trend continues, it could redefine the meaning of public honors education and further differentiate that education from what is offered by private universities in ways that might not appeal to many parents and students. After all, “going to college” has meant earning academic course credits in seminars and the disciplines, with participation in campus groups or volunteer work being left up to the students. Elite private universities, most of which do not have honors programs, continue to follow the traditional model. Internships and studying abroad are common, sometimes for academic credit; but participation in other activities is based on student choice. 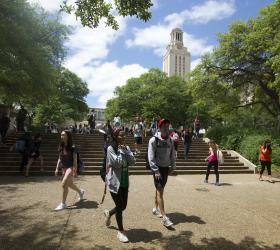 Most public honors programs have promoted themselves by promising the equivalent of an elite college education within a large public research university. I call this the standard hybrid model for honors colleges and programs. Thus far, the elite college part of the hybrid has been grounded in academic coursework. While it is fully justifiable to augment academic coursework with some experiential opportunities, providing experiential honors credit (but sometimes not course credit) for one-fourth or more of the total honors completion requirement could result in a hybrid within a hybrid: some honors programs will continue to offer mostly traditional academic courses and others will ratchet up experiential learning. Where experiential learning is prominent, the result will be less academically focused. How will parents and students react to this? They are often trying to decide between elite private colleges, which still emphasize coursework, and honors programs, some of which are becoming more experiential. Of greatest concern here is the last “Pro” listing: “Less costly to staff and fund; no teaching faculty involved.” How tempting it must be to administrators to offer honors credit without having to beg and borrow faculty and classroom space. If this becomes the primary factor in shifting from academic coursework to experiential learning, the trend could accelerate and have a profound impact on public honors education. To remain competitive with private colleges and universities, public honors programs should continue to be enhanced academic programs at their core, seeing their central mission as providing highly talented students a top-flight education, often in-state, and almost always at lesser cost than private university alternatives. When experiential learning accounts for more than about one-fourth of honors requirements, the core mission is likely to be compromised. There is a special pleasure associated with writing about honors colleges and programs in the state of Florida, especially when the spring weather in the northwest still feels a lot like November. But if you were a student at Florida Atlantic University’s Wilkes Honors College, you could have walked out of your honors dorm in early spring, strolled across the street, and taken in a spring training game at the Roger Dean Stadium in Jupiter, Florida, home of both the St. Louis Cardinals and the Florida Marlins. And if you happened to be a National Merit Finalist, you would be enjoying a full ride scholarship. And if you wanted to take only honors classes, with honors students, and faculty dedicated to honors education, you could. And if you wanted to go to the beach, well, darn, you’d have to drive 10 minutes or ride your bike almost a whole half hour to get to Juno Beach. And if you wanted a private bedroom in a suite-style dorm, you would have one. Or you could just head over to the shops and restaurants at Abacoa Village, less than a 10-minute walk away. More than 50 years ago, colleges began offering honors “programs” and many of these offered a relatively small number of honors seminars and departmental honors courses, with the bulk of honors coursework required in the first two “gen-ed” years. But in the last three decades honors programs have expanded, and now many universities have established honors colleges that offer special housing, advising, and an expanding array of courses. Even so, only a relatively small number offer their own honors degree or require more than 30 semester credits (or equivalent) in honors courses. 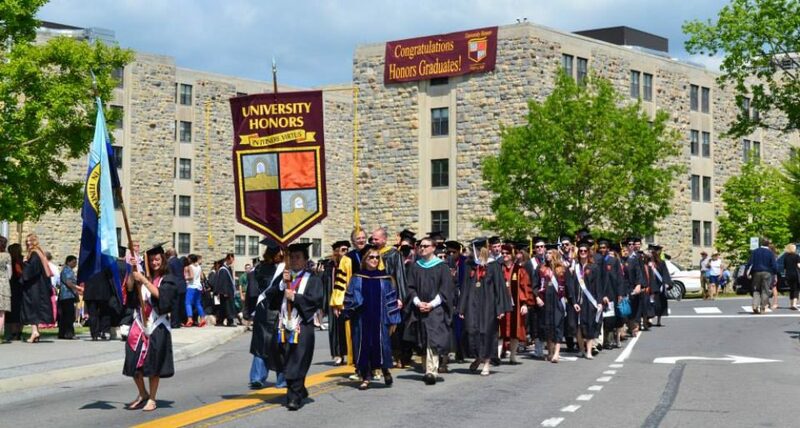 Of the honors programs and colleges that offer their own degrees, four are well-known: the Pitt Honors College, the South Carolina Honors College, the Virginia Echols Scholars Program, and the UT Austin Plan II Honors Program. Yet none of these require a student to take only honors courses to earn the honors degree, even though about a third of the total credits to graduate do come from honors courses. Now, the Wilkes Honors College at Florida Atlantic University (or, to be precise, near FAU), not only offers its own degrees in a broad range of special majors but also provides honors-only courses to meet the full graduation requirements. The WHC has its own faculty as well, and the college is actually located in Jupiter, Florida, about 40 miles north of the main FAU campus in Boca Raton. Note: The WHC will receive a full rated review in the 2018 edition of our book, INSIDE HONORS, due out in the Fall. “It is important to note that the Wilkes Honors College (WHC) of Florida Atlantic University (FAU) is a free-standing, liberal arts and sciences college” says WHC Dean Dr. Ellen Goldey, whose field is biology. “WHC offers a four-year, all-honors curriculum, taught by its own faculty of thirty-seven full-time members, all of whom hold the highest degree in their field and represent the full range of liberal arts and sciences disciplines. Full completion of an “honors concentration” requires 111 credit hours of honors courses across four years, plus a 6-credit thesis. AP credits can count for up to 45 credit hours. Students do not have traditional majors but choose pursue a major concentration: American Studies; Anthropology; Art; Biological Anthropology; Biological Chemistry; Biology; Business; Chemistry; Economics; English Literature; Environmental Studies; History; Interdisciplinary Critical Theory; International Studies; Latin American Studies; Law and Society; Marine Biology; Mathematics; Mathematical Science; Medical Humanities; Medical Science; Philosophy; Physics; Political Science; Pre-Med; Psychology; Spanish; Women’s Studies; or Writing. Engineering and computer science are not offered at WHC, but students who spend the first two years at WHC can follow a pathway to engineering at the Boca Raton campus. Science and research are central to the mission of the college. “The Senior Honors Thesis is required, so all students conduct original, mentored research, and many of our students conduct research for multiple semesters/years leading up to their thesis,” according to Dean Goldey. “Multi-year research is especially common for our science students (who make up about 70% of our student population). This is possible for a number of reasons unique to our campus: two world-renowned research institutes exist on our campus: the Scripps Research Institute – Florida, the only Scripps Institute outside of California, and the Max Planck Florida Institute for Neuroscience, the only Max Planck Institute outside of Europe. First- and second-year students are required to live in MacArthur Residence Hall I or II. Dining is across the street at the DH Dining Hall. Upperclassmen can also live in MacArthur. The mean SAT score for current WHC students is 1280; the mean ACT is 29. The college has a very high honors completion rate (students who complete all honors requirements and graduate) of 82 percent. The four-year grad rate is 70%, far higher than most public universities. Although the Lee Honors College at Western Michigan University offers more than 40 sections of all-honors classes, with an average class size of fewer than 16 students, perhaps the most impressive feature of the college is the range of inventive co-curricular learning options available to the college’s 1,785 students. As a reminder, the term co-curricular refers to learning experiences that complement classroom learning, whether for credit or not. Increasingly, co-curricular activities provide credits for participants. Dr. Carla Koretsky, Dean of the college, tells us that one of the co-curricular options is the Study in the States “placed-based” learning series. 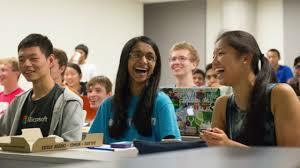 Offered for three credit hours, mostly in the summer, the courses are capped at 8-10 honors students. Garbage in Gotham: Anthropology/environmental studies course in New York City. Texas Tour: Business course in Austin, San Antonio and Houston, TX. Entrepreneurship: Business course in Austin, TX and Boulder, CO with additional travel to Detroit, Grand Rapids, Chicago and Cincinnati. Vue d’Afrique: French film course to the African Film festival in Montreal. The college also offers a weekly Lyceum Lecture series, featuring a weekly talk by a faculty, staff or community expert. Recent themes include Climate Change, Race Matters, Living with Uncertainty, Globally Engaged Citizenship and Sustainable Energy Future. A Metropolitan series takes small groups of students to museums and cultural events. “Recent groups have visited the Charles H. Wright Museum of African American History in Detroit, the Shedd Aquarium in Chicago, the Art Prize Competition in Grand Rapids and the Arab American Museum in Dearborn,” Dean Koretsky says. A Peer Student Success Team, comprised of upperclassmen who serve as mentors to incoming freshmen, “hold office hours in the honors residence hall, help with our events and organize at least four volunteer group events for honors students each semester. The presence of extensive co-curricular offerings is no indication that classroom learning has been slighted at the college. It is unusual for honors colleges and programs to offer only all-honors classes–sections that are not “mixed” or “contract” courses where honors students may been the minority of those enrolled. All the honors sections at the college are all-honors sections. Even better news: all of the major disciplines are included. English, history, math, chemistry, philosophy, business, psychology, economics, political science, and health-related classes are all a part of the course schedule. In addition, the college has an honors residential hall (Ackley) and includes priority registration for honors students during all four years of study. Prospective honors students often succeed in the Medallion Scholarship competition. “All competitors receive a 1-year $3000 scholarship and automatic admission to the honors college. Semi-finalists receive $6000 over 2 years and approximately 20 finalists receive $60,000 over 4 years. Finalists who complete an undergraduate degree in less than four years may use remaining funds for graduate study. Prospective students should know that the minimum admissions requirements are a high school GPA of 3.6 and ACT score of 26. The six-year graduation rate for honors entrants is 81 percent.